Resource War has been online more than one week. How do you like this feature? Do you have some advices or experience aboutit to share with us? If you do, share your ideas in the comment section. This strategy guide by Moratia's (S159) explains how to make full use of this feature. 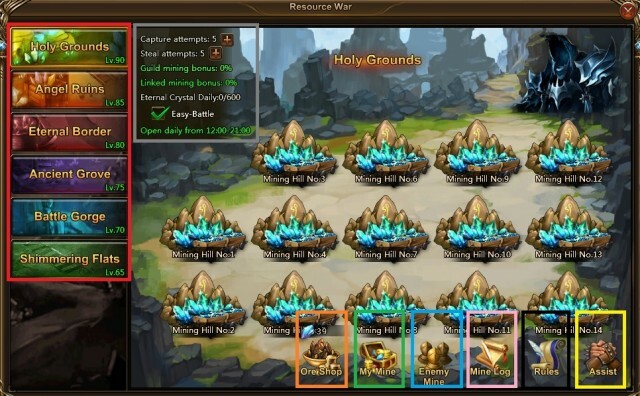 Resource War is a Cross Server feature. You will meet players from different servers here. You gather two resources from Resource War. Eternal Crystals are limited to 600 per day and Ore that has no limit. These currencies can be used in Ore Shop to buy Soul Arms related materials. Hills are accessible at level 65. A new hill will unlock at every 5 level up. Each Hill has 14 Mining Areas. There are two kinds of bonuses. ▪ Guild mining bonus increase for every mine one of your guild mates own in the same mining hill, linked or not. The higher quality of the mine, the higher the bonus. If your guild owns all mines of the mining hill, you’ll have 56% bonus. 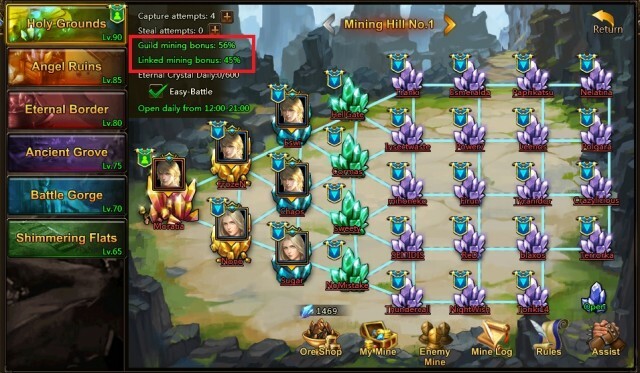 ▪ Linked mining bonus increases for every mine that connect to guild mate’s mine. That’s why you should seek to connect as many mines as possible. The line becomes bold when mines are linked. The maximum bonus if you’ll have is 45%. ▪ If your guild has both bonuses to full, you will gather 101% faster. With this bonus, even the lowest rank E mine will have higher yield than the highest rank A mine (with no bonus). ▪ 5hours in the lowest mine will be enough to reach the maximum Eternal Crystal per day. ▪ Youcan steal a percentage of your targets’ resource by defeating them or their assists. Only resource that has been excavated can be stolen. ▪ Youare representing in the map by a Green Flag, your Guild Mate are represent by aBlue Flag, your enemy by a Red Flag. ▪ You will want your guild to choose a Mining Hill and all go there, the level of the Hill you will choose should allow most of the guild to be there to get a higherbonus. For example, you have 3 levels 90 in a guild and 60 level 88’s, you should go to a Mining Hill level 85, evenfor the level 90+ they will earn more due to the bonus there as if they go intheir own Mining Hill level 90. Once you choose a Hill, send a guild message toinform everyone where they should go. ▪ If you are not enough or not strong enough to hold a Mining Hill on your own, youcan try to form an alliance with other guild from your server or from other server to split the Hill and increase both guild’s bonus. ▪ Follow your guild leader’s choice and try to take mine thatis connect to other guild member’s mine and offer most options to link to other mines. You will want to attack a mine inthe center of the map that can be connected to 5 others mine than take a minein a corner that offer only 2 connections. Defend your territory! You have 5 Steal Attempts daily, chase out intruders and help your guild mates capture mines and protect them when they need.You might lose a few Ore by doing so, but if it allows your guild to build a strongnetwork so you’ll get them back very fast due to the bonus. ▪ You have no Guild or your Guild is not well managed and has no clear direction onthe Hill to take. Choose wisely were to settle yourself. Avoid every Hill where a guild has made clear intentions to own it. They will probably chase you and you will lose a lot in the process. Incase you have no other choice than to invade a guild, go to the corner or to the mine that will be the lessannoying as possible to them so they will consider leaving you alone. Don’t aim too high on the mine, you have to know your position in the X-Server and take a mine you are able to keep. The OreShop allows you to convert your currencies into materials to improve/upgrade your Soul Arms. ▪ Itis not recommended to convert your currencies until you really need to. Thegame is in constant evolution and new stuff could be added in the shop. ▪ Actuallyyou need 50 shards to Synth one weapon so 50*80=4000 Eternal Crystal. That meanit take 7 days to have enough Eternal Crystal to buy the shard. This provides information on the rate you digresource bonus included, how many Ore player steal you or you lost by moving orbeen chased. It allows you to extract resource early or at the end and abandonyour mine. If extract early cost you 1000 Ore and you get everyday Steal 2000 Ore, you can extract early to reset the amount player can steal from you and be less attractive to them. Enemy mine have more or less the same information and allow you to attack them back; I highly not recommend using this feature. First if he successfully got you infirst place, there is a high chance he gets you again and you will waste attempt on him. It have a nice information value if you see the player have agood stock in reserve you can still inform your higher member that he can be adecent target. Later he’ll maybe think twice before Steal from you. Give accessto the combat log of player who attacked you. You can ask a friend to protect you mine for the next 20 minutes. Each playercan protect others 3 times per day and can be protected 3 timesper day. It can be very useful to help some specific player you know they log late. For example, give him a high rank mine to help him get his 600 Eternal Crystal and use the assist to ensure nobody kick him. It is alsovery useful when you establish your network in first place. Player who protects others will get some Ore as reward and you will win the same on your side. This is a win-win relationship. Next：Key to Empower Relics- Palace Dungeon!